Coffee Talks and Cat Walks: Time to Crush It! A client of mine introduced me to this book. ...and I'm so glad she did. I just finished it. ...and now the creative juices are flowing. I'm ready to practice everything that I've learned. I'm pumped with excitement and running on adrenaline. 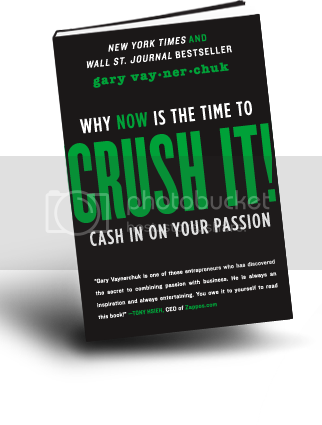 It's a fabulous read and I recommend it to anyone interested in cashing in on their passions! Very motivational! CRUSH IT! Thanks for the heads up. I love books like this. In order to cash in, doesn't someone need to know their passion? Yes, you do need to know your passion. But that is up to you to discover. You know what makes you happy and what brings you joy. If you are able to determine this, then you can cash in on your passion.